Today is an exciting day!!! 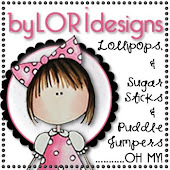 For months now, have been asking my Mom if I can start my own challenge blog for young crafters, card makers, scrapbookers, etc. etc!! Finally, she said YES!!!! All of you Mommas out there can join us as well, but I sure hope A LOT of kids will want to play along!!! This is a perfect time to start my challenge blog for children because my mom is a SU! 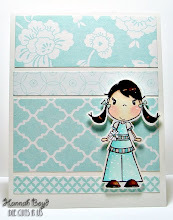 Demonstrator and she said that this is Kid's Month at Stampin' Up! Woo Hoo!! 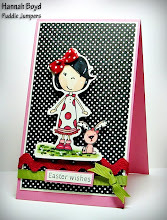 Kids can be card makers too!!! Congrats on your new challenge blog! I will do a special post tonight to promote you on my blog! I have lots of mom's with little ones! My little guy is only 3, so maybe he can join in in a couple years :) Good Luck Hannah!!!! Hannah I think this is just a brilliant idea - wow well done you. My girls are too old for your challenge, but I will certainly put a post on my blog for my friends to see. Maybe my friend Max's daughter will take part. Well done Hannah I love your card. I hope you get loads of girls and boys taking part in your challenges. I LOVE your card Hannah! i am so glad we were able to play along this week!!! Good luck on your challenge blog and I'll mention it in a special post for you! Congratulations on your new challenge blog Hannah! I'm not a kid anymore - even though I might act like one sometimes :) Will try to remember to put a link to you on my blog when I make my next post. Hope you get lots of participation! Awesome card Hannah, You should really start this back up, I would LOVE to play along!